Hiya guys! I am so excited to announce that the whole messy legal situation I was in (that was causing me severe depression/anxiety) is now officially over! 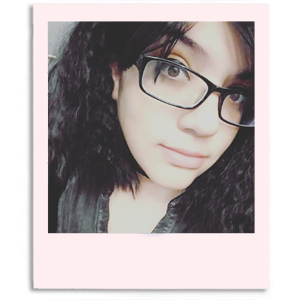 After four long months I can finally breathe easy and feel like myself again, which I have missed. Thank you for sticking around, I know my work was heavily affected during this time period and I am grateful to those who stuck it out. Without further ado, today I am sharing swatches for another fantastic Halloween collection. 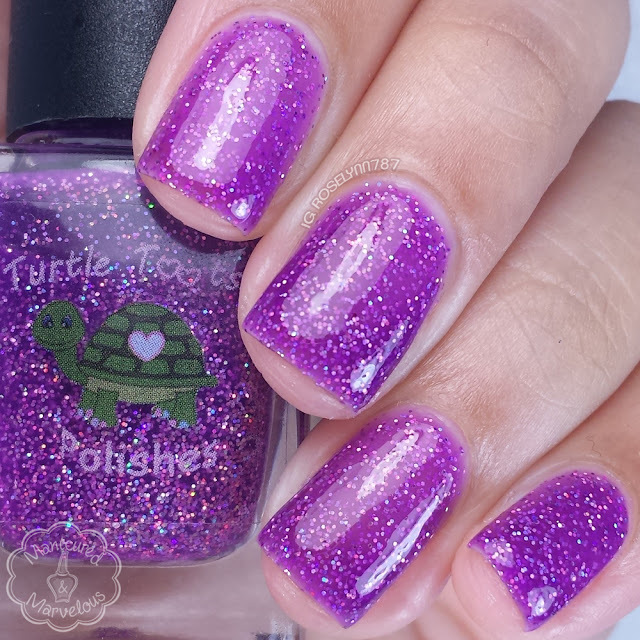 This new-to-me indie is Turtle Tootsie Polish and this collection makes their fourth since their launch date earlier this year. I have seen a lot of positive buzz about this indie and with Halloween being my favorite holiday this was definitely off to a pleasant start. 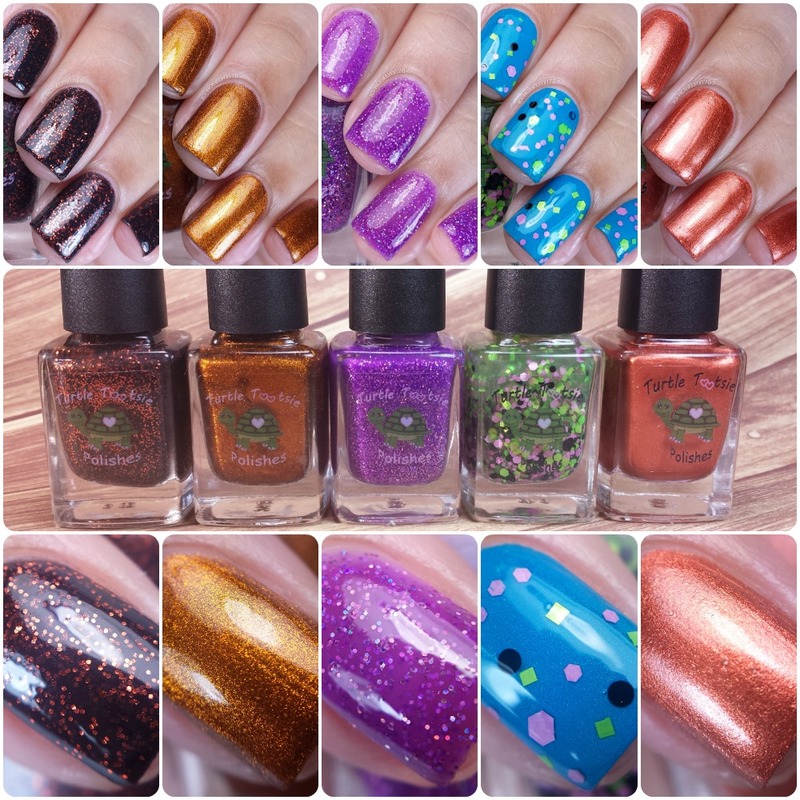 The Halloween 2015 Collection by Turtle Tootsie Polish is available for purchase today Friday, October 2nd. The polishes range from $8-10.00 for full sizes and $5-6.00 for mini sizes. The full collection will be available for $40.00 for full sizes and $20.00 for mini sizes. Magic Pumpkin can be described as a black jelly with holographic orange glitter. Love the combination in this one, it's very Halloween without being too over the top. It definitely has that gorgeous squishy feeling, but again not too much of it either. Nice formula and consistency, not too thick or too thin. It does apply a bit on the sheer side, but it ends up evening out perfectly. Shown here is three coats sealed with a glossy topcoat. Smashed Pumpkins can be described as a dark aluminum-metallic orange polish. So... this is love and this time I know it to be true. Once you look at the macro I'm sure you'll understand what I am feeling. I never thought I'd fall so hard for this kind of tone/shade, but it's so gorgeous. Do I really need to tell you this is a must-have? With me gushing this hard over it I'm sure you know. The formula is absolutely excellent as well. The layers are smooth and the consistency is really opaque in a single coat. Shown here is two coats sealed with a glossy topcoat. Glittery Brew can be described as a purple jelly with holographic purple glitter. Squishy squish time guys! This is such a beautiful glitter to color combination no matter the holiday or season. Very girly and fun as well. The formula is smooth although sheer since it is a jelly. The layers build up nicely and even out as you add on. It does finish off with a slight 'sheerness', but you have to look really closely to be able to see the nail line. Since it is a glitter heavy polish, I found it best to add a second layer of topcoat to smooth it all down. Shown here is three coats sealed with a glossy topcoat. No Costume, No Candy can be described as clear glitter topper with bright green, purple, black, and black heart pieces. 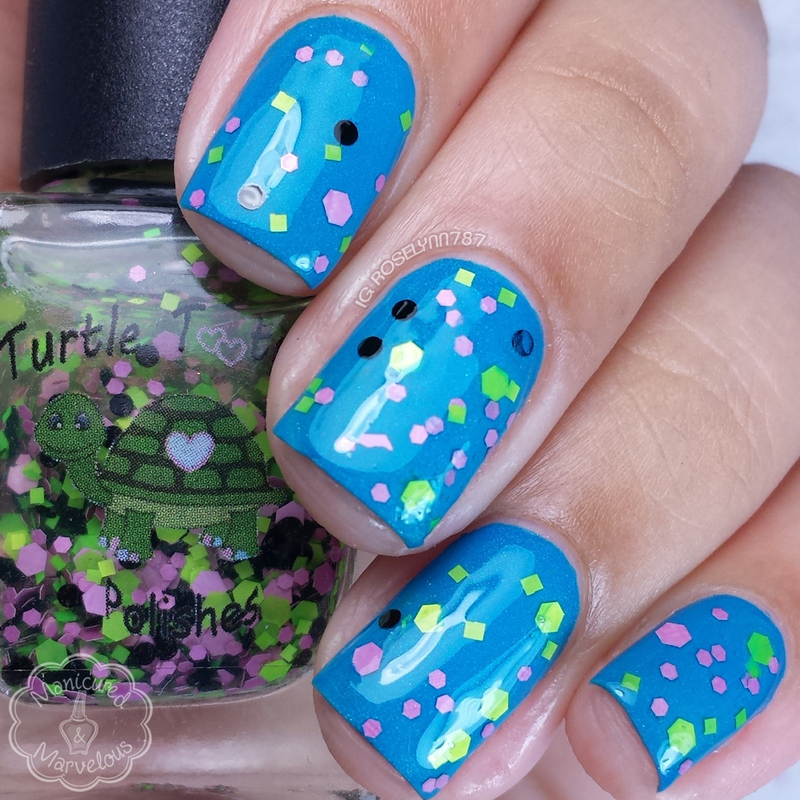 Since the glitter combination seemed so happy and fun I decided to pair it with an equally fun and bright blue base. I think this combination looks freaking crazy beautiful, the colors bounce off each other well. The formula for this topper requires a dabbing method of application in order to achieve the best results. There is some fishing involved and obviously placement with the glitters. The consistency is a little on the thin side, which only exceeds the need to dab the coats on. Personally I don't mind dabbing glitters on, but I know it's not everyones cup of tea. Shown here is two dabbled coats sealed with a glossy topcoat. Blood Curdling can be described as a dark red-orange polish. 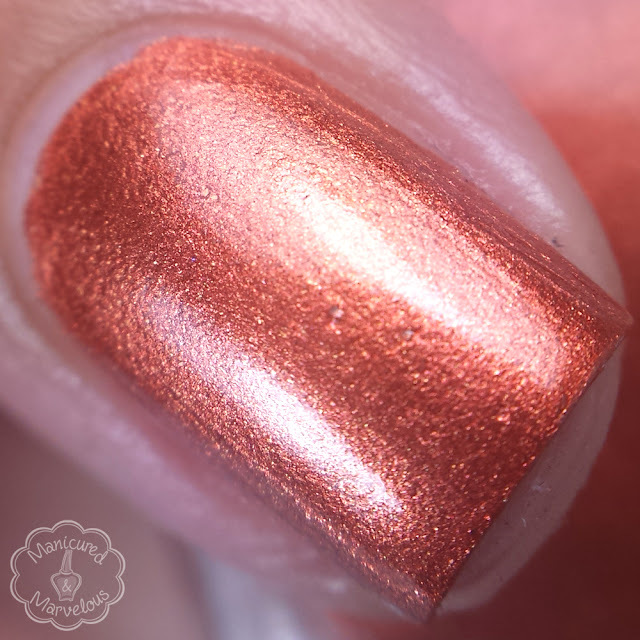 Like Smashed Pumpkins, this polish has a very metallic feeling to the finish. It adds a nice change of pace from the dozens of orange shades we're seeing this season. The formula is smooth, but brush strokes are a bit visible if you look closely enough. Another very opaque formula with this one, almost to the point of being a one coat wonder. Shown here is two coats sealed with a glossy topcoat. Overall I think this is a really cute and well put-together collection that everyone can enjoy. Even though it's meant as a Halloween collection, I think it comes off appropriate for Fall in general. I know that not everyone is as crazy for Halloween as I am so this is definitely a nice touch in reaching out to every ones polish wants. If I have to pick one stand out must-have from this collection, it would have to be Smashed Pumpkins without a doubt. I know a lot of us shun metallic finishes to the side, but this is one that definitely deserves a shot. Glittery brew is lovely! Gorgeous, as always! I adore the two pumpkin polishes. So glad to hear you're feeling better. Those oranges are to die for! Magic Pumpkin is my favorite from this collection! All gorgeous and your nails are lovely! Fantastic swatches! Magic pumpkin is a winner for sure! Loving this collection! Your swatches are to die for! Oh I just love Blood Curdling and Smashed Pumpkins! This is a great collection! Another perfect collection for Halloween! So beautiful, those metallics look absolutely amazing! They are lovely shades. I like their names so fun. I think I loved magic pumpkin so much. Glad you finally have relief from your stressful situation - hope it went well! Beautiful pics - I especially love the metallic shimmers. Magic pumpkin is lovely. I'm glad your stressful situation is over with!! I really like Smashed Pumpkin the best, but these are all lovely. Your swatches are gorgeous! The purple and the topper are my faves! Beautiful swatches! I am really liking that orange shade. I see so many options for art! Ooooh Magic Pumpkin is my favorite! I really like the whole collection- there's a ton of variety in the colors and finishes. Congrats on getting through what sounds like a really tough time! Smashed Pumpkins is my jam! Gorgeous swatches! I love Glittery Brew.